Axor Uno² is a truly individual mixer collection. Its understated, geometric style makes it a classic minimalist, and it will blend into any bathroom environment. Glamorous or discreet, purist or extravagant, Bauhaus or post-modern – Axor Uno² gives people the scope to express themselves. This is just one of many reasons why this mixer collection has become a design classic. Axor Uno² mixers are characterised by their clear, geometric basic shapes. For the wash basin, you can choose between the single lever and the two handle mixer. The characteristic high spouts are perfect for high wash bowls. Space-saving wall mixers supplement the range. For bath tubs and showers, mixers and thermostats offer a wide variety of design options. The Axor Uno2 style's clear, timelessly modern geometry also accentuates shower design: with matching hand and overhead showers, in the form of a shower set or in combination with side showers. The sleek, cylindrical design runs through the entire collection and is also featured in accessories such as the shelves, towel holders, grab bars, wall lamps and lots more. The Axor Uno2 wall mixer for the kitchen features a practical telescopic spout, which can easily be extended and swivelled. For greater freedom of movement at the sink. Or you may opt for the sink unit mixers with a 360° swivelling spout. All mixer handles can be positioned on the right-hand or left-hand side. 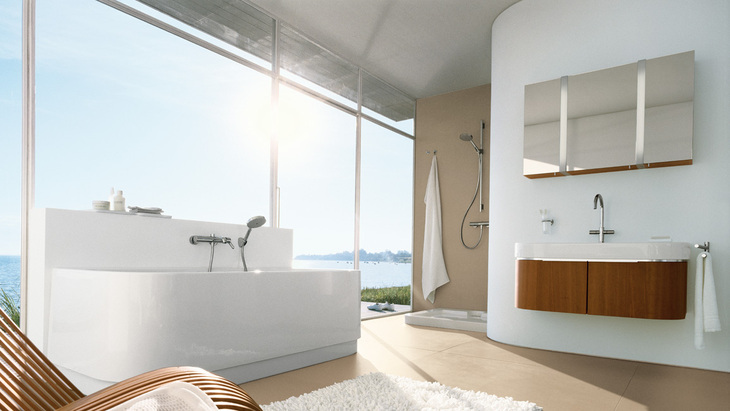 Which wash basin matches Axor Uno²?